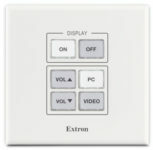 The Extron RGB 472xi is a wall-mountable, analog computer-video and audio interface with ADSP™. It allows up to two computer-video inputs with resolutions up to QXGA to be converted for output to projectors and flat panel displays. 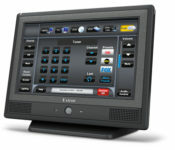 It also accepts unbalanced computer stereo audio and outputs line level stereo or mono audio. 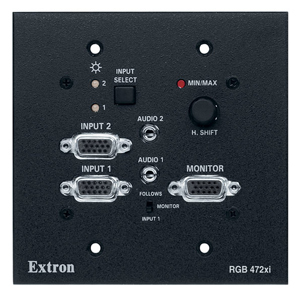 The RGB 472xi installs in a standard US two-gang wall box and is ideal for applications that require signal amplification and sync processing to ensure compatibility between many different types of displays and computer-video signal sources found in classrooms, auditoriums, and conference rooms.